Pictures and details on the HTC "Volantis" were revealed by Android Police, which said the device is internally referred to as the "Nexus 9." The device is said to have an 8.9-inch display with a resolution of 2,048 by 1,440 pixels, a size that would place it in between Apple's 7.9-inch iPad mini, and 9.7-inch iPad Air. Google and HTC are apparently planning for the device to be a premium-grade tablet, boasting a 64-bit Nvidia Logan processor, 2 gigabytes of RAM, and an 8-megapixel camera with optical image stabilization. The leaked information suggests the device will sell for $399 with 16 gigabytes of storage, pricing it identically with Apple's iPad mini with Retina display. 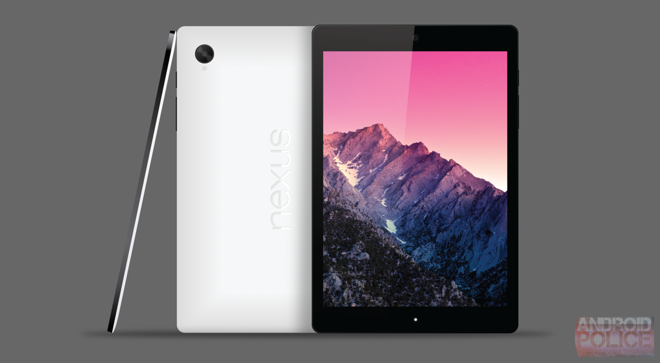 Though Google's I/O conference kicks off Wednesday, the so-called "Nexus 9" is not expected to be unveiled this week. Instead, Google is said to be holding the debut of its next-generation flagship tablet for the launch of "Android L," an anticipated update for its mobile platform. 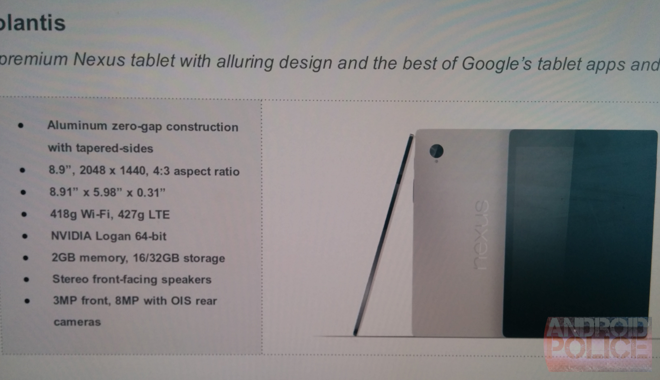 The Nexus brand is used by Google to spotlight different hardware manufacturers within the Android ecosystem. The first Nexus tablet, the Nexus 7, debuted in July of 2012, only months before Apple would introduce its blockbuster iPad mini. Despite a deluge of competing devices from companies like Google, Samsung and Amazon, Apple's iPad lineup remains by far the market share leader in terms of tablet sales. But growth in the overall tablet market has slowed in recent quarters, following an explosive growth period led by the debut of Apple's first iPad in 2010. As for the Google I/O conference this week, it's widely expected that the company will focus on its new Android Wear initiative for wearable smart devices. It's also expected to take the wraps off the successor to Android 4.4 KitKat, only known for now as "Android L."
Apple unveiled its own next-generation mobile platform, iOS 8, at its Worldwide Developers Conference earlier this month. iOS 8 will launch this fall, while Apple is widely rumored to enter the wearable devices market this October.